A Tennessee woman has been accused of setting fire to a home because she wasn't invited to a party. The lady identified as Shameka Howse was arrested on Wednesday and charged with vandalism, aggravated arson and reckless endangerment/assault with a deadly weapon for the incident. According to an affidavit from the Metro Nashville Police Department, Howse and an unidentified man pulled up at a house on North 29th Avenue in Nashville on June 28 and when she began screaming about not being invited to a party at the house. From there, police said she walked back to the truck, pulled out a jug of lighter fluid and started pouring it over the front window of the house. Police says she then took a butane lighter and lit a fire. 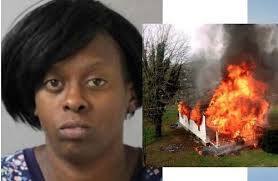 Woman sets house on fire because she was not invited to a party? According to investigators, Howse and the unknown driver fled as three people inside the home tried to put it out. The flames were extinguished before any serious damage was caused, and no one was hurt. Howse who was arrested on Wednesday is being held on a total bond for $45,000.